"Why do you play cymbals?" If you can answer that question and pass the criteria, you're on your way to winning a scholarship sponsored by the exclusive cymbal organization known as κψμβοσ (Kymbos). Pronounced "kimbos," Kymbos was the brainchild of creator Jack Borland, a performer/instructor who saw dwindling cymbal lines in drum corps battery percussion sections and began a crusade for recognition while giving the existing lines a fraternity-like haven. For the past several years, DCI's cymbal lines would gather on tour, share techniques, ice cream, and secure their Kymbos patch of the year courtesy of Borland and friends. But in the back of his mind, Jack knew there was more to do. A scholarship for cymbal-playing corps members was the logical next step. "This is something I have been wanting to do for a couple of years now, but have never had the means to get it off the ground," Borland said. A couple of months ago, Borland and Chelsea Levine, a recently aged-out cymbal section leader from the Crossmen and Borland's assistant staff tech at Spirit of Atlanta this summer, started discussing the logistics of making a scholarship work. As with many fledgling programs, the financial means to support the award was one of the first obstacles to overcome. While pondering the details, Levine hit on the idea of selling a specialized type of glove designed to help players grip the cymbals as they're whirling, twirling and crashing the metal discs throughout a performance. "My mom Carole agreed to take on the manufacturing of the gloves, and is largely the person that made this all possible," explained Borland. "Chelsea and I reached out to various indoor percussion line contacts we have to see who might be interested in purchasing them. As the proceeds were all going toward a charitable cause, we found the response to be pretty overwhelming." In addition to the gloves, numerous performing units also donated to the scholarship fund. Eventually, what started out as a way to raise a modest scholarship of $300, quickly exceeded expectations. 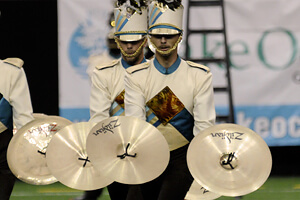 "We are in a position to offer three $300 scholarships to marching members of DCI corps in 2012," Borland said. In its first year offered, the Kymbos scholarship will be available exclusively to World Class corps members. All who are eligible for the award have already been notified of the requirements, with an April 16 deadline for applications. Judging for all submissions will take place from April 17-30, by a board consisting of World Class cymbal staff members as well as three at-large judges with extensive experience in the drum corps activity. "Having knowledgeable and talented DCI cymbal instructors be a part of the judging process will ensure that the best candidate receives the scholarship," Pioneer percussion staff member Jen Tarka said. "This scholarship shows to all cymbalists, marching members and DCI fans, that cymbal lines are still a proud and valued tradition of the drum corps activity." Currently known World Class units with full marching cymbal lines include: The Academy, Cascades, Colts, Crossmen, Jersey Surf, Mandarins, Pacific Crest, Pioneer, Spirit of Atlanta, Teal Sound and Santa Clara Vanguard. Borland and Levine aim to extend this scholarship opportunity to Open Class corps and WGI indoor percussion groups in the future. While the issue of relegating cymbals to the front ensemble percussion section vs. retaining them on the field has been hotly debated for years, this clan of copper-crashing specialists believe they have more to offer than accents on a music sheet. And over the past few years, they have exponentially proven their "metal" on the judging sheets, executing daredevil moves worthy of Cirque du Soleil. Now they have their own award of merit that will bring recognition to these intense students of the cymbal craft. "This scholarship is a remarkable way to bring light to an instrument that has been in the shadows for so long," said Jenny Jackson, a cymbal staffer with the Academy in addition to Riverside Community College and Mission Viejo High School in California. "Cymbal playing is a true art that has really been overlooked for years. But not any more! This is just the beginning." Learn more on the Kymbos Facebook page.